If you’re looking to move away from a permanent role and spring into a contracting career, ContractingWISE is here to help. Making the move from permanent employment to contracting can be a big step. 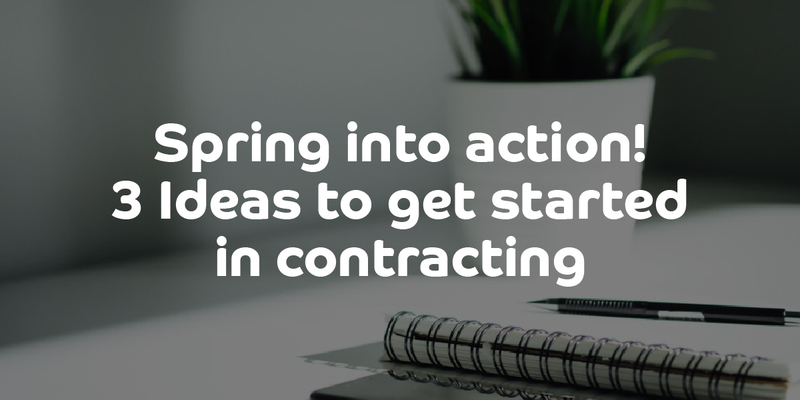 If you’ve recently decided to enter into contract work or are still considering it as an option, browse our tips below to get started in contracting and see if you’re ready to make the leap. 1. Is there a market for your skills? First things first, before you leave your permanent job you need to assess whether there is a market out there for your skills, and if the jobs and projects available are lucrative. You can research this by checking available contracts on top recruitment websites. Once you’ve established if your skills are in demand, you need to define your target market. Based upon your skill set and experience, establish which companies, markets or sectors are a good fit for you. Perhaps you’re a project manager with a track record in finance, or an IT support worker that’s also dealt with healthcare – all of these specialisations are good for contracting. A top tip to get started in contracting and to sell your skills is to highlight your unique selling point (USP). Identify what singles you out from other contractors, as contracting is a competitive field. If you can show that you’ve got something to offer that others don’t then you’re more likely to be awarded a contract. Whether you’re an expert in a particular field, have a wealth of experience in your industry or have perhaps already delivered on a very similar project when you were traditionally employed, showing off your USP will make you stand out to potential clients. Once you’ve outlined your target market, you can begin to focus on marketing yourself towards that specific audience. Make sure you tailor your CV to your target market, industry, and individual roles. This will help improve the responses you get back. Then spread the word by getting your CV onto agency databases, contractor job boards and professional platforms like LinkedIn. At ContractingWISE, we work with contractors and recruitment agencies, so if you’re looking for your next contract, get in touch. Once you’ve identified your ideal market, you will need to prepare yourself for accepting contracts and getting paid. When moving into the world of contracting you need to decide on a suitable business structure. You can either choose to set up your own limited company, or join an umbrella company. If you decide to set up a limited company you will need to become a company director. You’ll be required to submit annual accounts and meet HMRC tax deadlines. One of the benefits of setting up your own limited company is that as a company director you have the flexibility to structure your finances in a tax efficient manner. Although there is an element of admin, it isn’t difficult to set up and run a limited company, and ContractingWISE can assist you through the process if you decide this is the right path for you. Alternatively, you can join an umbrella company. This is the best option for people who are considering contracting but are put off by paperwork and the idea of running their own business. Umbrella companies will take care of your invoicing, fee collection and deducting tax and National Insurance, for a fee. This means that you will be a PAYE umbrella employee and will be on the umbrella payroll. This option will relieve you of the efforts of running your own business but does mean you’ll potentially be paying more tax than a contractor who contracts through their own limited company. If you decide that using an umbrella company is the right option for you, then it’s important that you look into what fees and charges you’ll be faced with. ContractingWISE can help source the right umbrella company for your needs. Before starting your first contract it’s also important to make yourself aware of IR35 legislation. Some contractors can find themselves inadvertently within the scope of this legislation which seeks to combat a specific area of tax avoidance. For peace of mind, check all contracts carefully and if you’re unsure on the IR35 status of your contract, contact us and we can put you in touch with professionals who can help. Unemployment is at its lowest rate since 2008, and contractors are in high demand, especially in the IT, Finance and Engineering industries. But there’s no guarantee that you will win your first or next contract in time for the next mortgage or rent payment. There’s not necessarily always a smooth transition between contracts so that they’re lined up one after another. Although it’s unlikely that you’ll be out of work for a significant period, especially if you have been planning to move to contracting for some time, it’s best to make sure that you’re covered just in case. It’s also worth considering that as a contractor you will not receive holiday or sick pay, unless you work under an umbrella company arrangement. So, it’s best to plan ahead to make sure you’re covered for all circumstances. It would be wise to set up an emergency fund in case things don’t go as planned. This is especially important if you’ve left permanent employment before securing your first contract, as the lifestyle you and your family enjoy can be sustained. As an extra precaution, it’s worth sourcing income protection insurance, alongside other necessary insurances if you’re working as a limited company contractor. Having an appropriate amount of money set aside will give you the reassurance and peace of mind that you will be covered until you secure your first or next contract. This means you can get on with the important things like finding a contract you’ll love, rather than the first one that comes along. As a rule of the thumb, plan for an emergency fund of roughly 3 months’ living expenses to be available whilst you find your feet a contractor. Are you ready to get started in contracting? Download our FREE contractor checklist to help you get you started.